I am Hide. I graduated from Tokyo Sushi Academy and got my Diploma in Japanese Traditional Style Sushi in 2015. I have taught more than 450 tourists how to make sushi in English or Japanese. I studied English in Vancouver, Canada when I was a university student. I love touching upon different cultures and talking with international tourists. 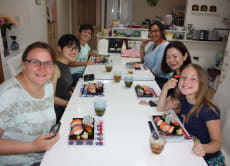 One of the most important things in my life is to tell the international tourists about wonderful Japanese traditional culture through Sushi making Experience. When I hear from them “I like Japan, I love Japanese people, delicious food, clean, safe country, and wonderful experiences I ever had in Japan”, I am always very moved as a Japanese person. Since I began teaching how to make sushi, I have come to think about teaching about Japan trough this tour as my lifetime job. I really want tourists to have lots of wonderful experiences and memories, while traveling in Japan and bring back with them to their countries. My dream through my job is to increase Japanese Fans and repeat customers visiting Japan! Experience Genuine Sushi Making in Tokyo! This experience was a highlight of our Tokyo trip and I can recommend this to anyone interested in getting to know the unique art of Japanese sushi-making in a very personal and friendly atmosphere. My nephew (11 years old) and I had a wonderful evening at Hide's home and really did produce some tasty Sushi. I highly recommend this workshop, Hide is a wonderful teacher and you can learn a lot about Japanese culture.